A slow-moving but confident spaghetti western, God Forgives...I Don't! (also known as Blood River) is a serious story of revenge played out at a deliberate pace. The first teaming of Terence Hill and Bud Spencer generates decent momentum and a few good sparks. A vicious train robbery has left all but one of the passengers dead and a large amount of gold coins missing. Investigative insurance agent Hutch Bessy (Spencer) believes that the notorious gangster Bill San Antonio (Frank Wolff) is the only man capable of pulling off such a job. The trouble is that Bill is supposed to be dead, having been killed by Cat Stevens (Hill) a year earlier at the infernal end of a crooked poker game. Hutch convinces Cat that they both have a reason to track down the elusive Bill and his gang, and Cat begins to realize that he may have been used as a pawn in Bill's elaborate scheme to fake his own death. Cat and Hutch overcome Bill's guards, seize the heavy treasure, and bury it. The hunters then become the hunted: Bill and his henchmen set off after Hutch and Cat to try and shake loose the location of the twice-stolen booty, but the climax will have to involve a proper ending to that long delayed poker game. God Forgives....I Don't! suffers from a lackadaisical stride, at 109 minutes the movie stretched beyond its content. In a case of too much violence rubbing the edge off all the violence, Director Giuseppe Colizzi ultimately includes too many similar, prolonged, and forgettable scenes of too many nondescript men killing or beating each other. But in a case of aesthetics exceeding plot, God Forgives...I Don't! is more memorable for look and feel than narrative. Colizzi nails an overbearing environment of an unrelenting sun in a sparse hot desert, ramshackle buildings, and sweaty men invariably up to no good. Alfio Contini's cinematography is expansive, the film decked out in unforgiving yellows and browns where plenty of nothing grows. And Carlo Rustichelli contributes a faux epic soundtrack, used sparingly but to good effect. God Forgives...I Don't! is also conspicuous for its excessive bloodshed. While the gore quotient is low, the amount of casual killing is extreme, starting with the piled-up dead bodies on the train and culminating in Cat and Bill clearing a taverna of innocent patrons by shooting them dead because there are "too many people" for their meeting. Scenes of torture and brutal beatings are regularly sprinkled throughout the film. 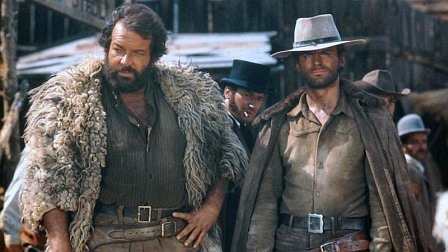 Terence Hill is badly dubbed but contributes his lithe physicality, while Bud Spencer is more of a presence than an actor, his bestial strength a good complement to Hill's agility. 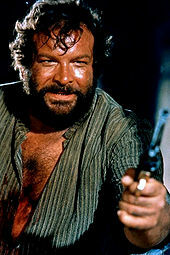 A large part of the movie's appeal is thanks to Frank Wolff's well-developed, bushy pork-chop turn as Bill San Antonio, a spaghetti western villain worthy of the name, demonstrating smarts and cruelty in equal measures. In God Forgives...I Don't!, the treasure is the bad guy, rather than his loot.